News Americas, HARLEM, NY, Tues. June 24, 2014: Eighty-four-year-old Congressman Rep. Charles Rangel of Harlem on Tuesday night, beat back a fierce challenge from state Sen. Adriano Espaillat to claim a 23rd and final term in Congress. With 100% of the precincts reporting, Rangel had 47.4% of the vote to 43.6% for Espaillat, a margin of about 1,800 ballots in the 13th District Democratic Primary, unofficial returns showed. Congressman Gregory W. Meeks, raised Rangel’s, hand in victory, after declaring him winner in the rematch of the Democratic Primary election, against Espaillat, Tuesday at Taino Towers, in Harlem, New York City. “This was our victory. This is your congressman. And you can rest assured all I will be doing is thinking about you and bringing these resources home,” Rangel said. 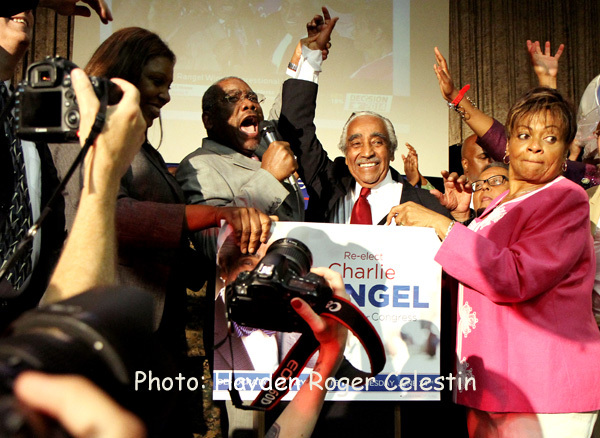 With no Republican on the ballot in November, Rangel is almost guaranteed to return to Washington in January.